When I originally started writing this blog entry, I typed “U2 comes to the desert: Covering a mega-concert via new media” as the headline in the WordPress title box. And that’s what this post was going to be about — how John Katsilometes covered U2’s recent concert in Las Vegas. To say I was impressed with how Johnny Kats covered it is a huge understatement. As I have written before, this guy impresses me a whole lot of the time, and I literally think he represents a major facet of how local journalism can/will survive. But as I looked at his coverage of the U2 concert, I realized something else was going on there. Our web team at the Las Vegas Sun is typically associated with mega-huge databases or over-the-top multimedia packages or the biggest breaking-news event coverage you’ve ever seen. However, lately we’ve really been focusing in on how to use new media to tell daily stories. On deadline. In real-time. That’s how John covered U2 — using lots of new-media tools and philosophies and never once opening Photoshop or Final Cut Pro. It was simple, effective and extremely webby. And it wasn’t published in a print edition three days after the concert was over. It was for, and — more importantly — of the web. John had posted a couple pre-concert blogs about the U2 show, including this one on some of the band’s previous shows in Las Vegas. 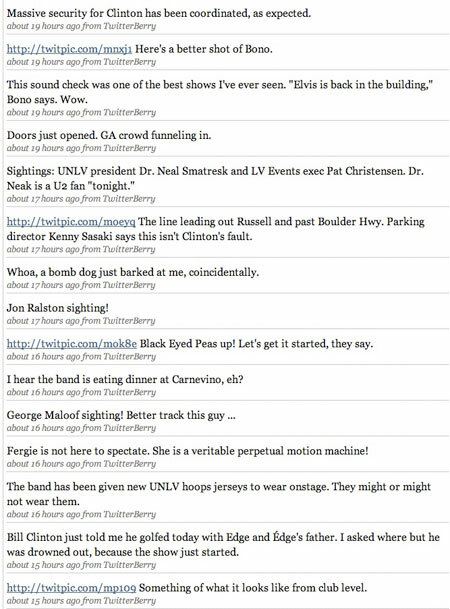 Then Kats’ gameplan was to cover that evening’s U2 show by spending lots and lots of time with the folks at UNLV who were in charge of the show, via Sam Boyd Stadium. He was armed with his notepad, BlackBerry and digital camera. His coverage began — and continued through the entire night — with constant updates on Twitter. Throughout the entire night, John was taking photos on his phone’s camera. 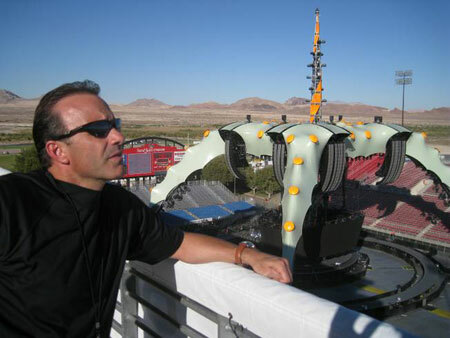 They were oftentimes immediately posted, like this shot of UNLV’s stadium director Daren Libonati as the final touches are being placed on U2’s stage. So after all of the tweeting and reporting was done, John began writing his story. When that was completed, he posted the story himself into our organization’s online publishing system. This kind of stuff does not freak out John. He gets right into our site’s content management system to not only post the story, but to add and move around the story’s other elements — like photos. Yes, it’s a certain amount of technical acumen, but it’s more than just being comfortable with computers. John can write. He loves to tell stories. It’s that love of storytelling that is at the core of what he does. What makes what John does so brilliant is that he can do it so effectively and in such an entertaining way whether he’s writing a quick four-paragraph blog for one of our Web sites or a 5,000-word story that ultimately ends up in print or 140 characters in Twitter. And it all works. Each element can work singularly or as a body of work — doing it mostly with words. Not Flash. Not self-shot and self-edited video. The guy couldn’t write a line of programming code if you held a gun to his head. He’s a storyteller who not only isn’t afraid of new-media, but embraces it. John Katsilometes is proof positive that you can still be extremely effective in this new world with old-school skills. I know I must sound like a frickin’ broken record, but it really is all about mindset. I have seen this before. 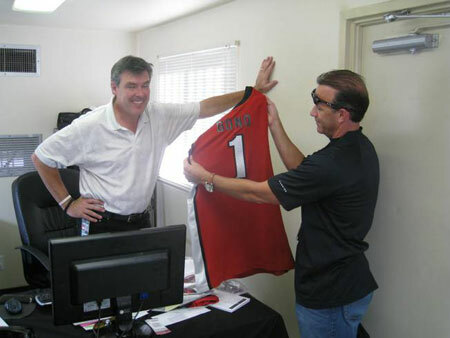 Back when I was at The Washington Post, I posted a blog about Post sports writer Barry Svrluga (then the Nationals beat writer and now the Redskins beat writer) and how he was navigating all of the change in our industry incredibly well. So, how can a traditional print journalist stay relevant through all of this crazy change? But my gut tells me the soup tastes a whole lot like what these guys are cookin’. To comment on this post, or to see comments about this post, please go here.